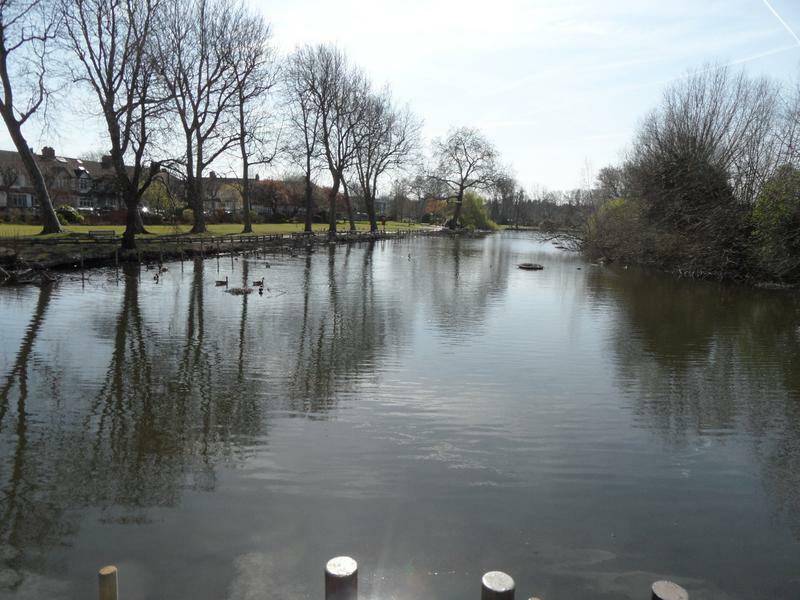 station. 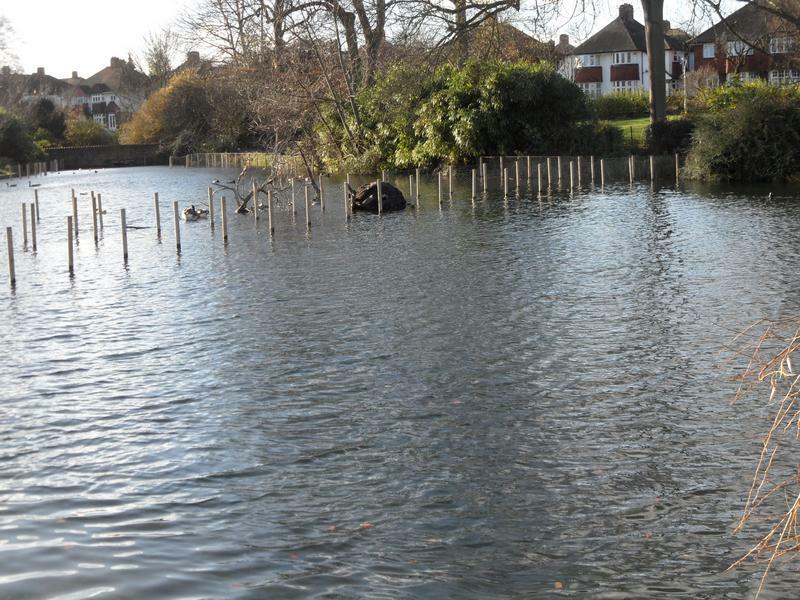 There are entrances in other roads, including Mill Lane, next to John Lewis. Closed at night. 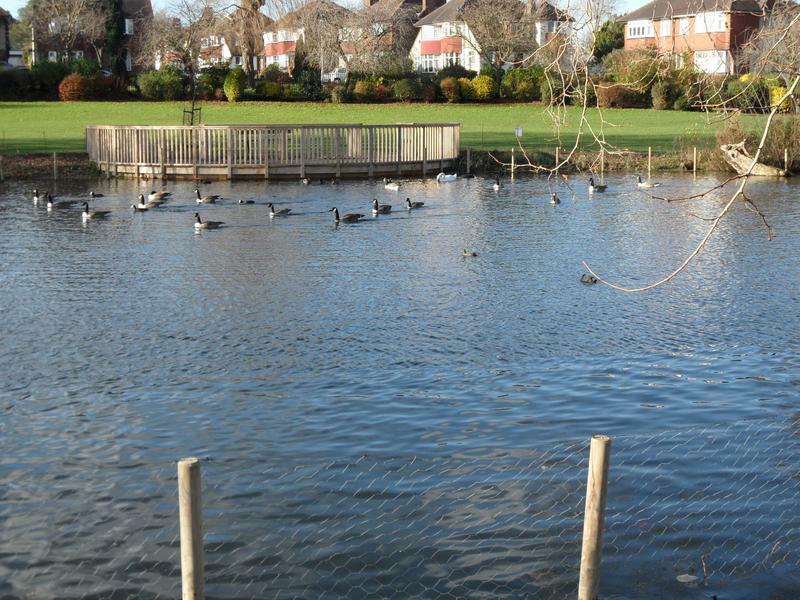 The main Waddon Pond seen from near John Lewis. 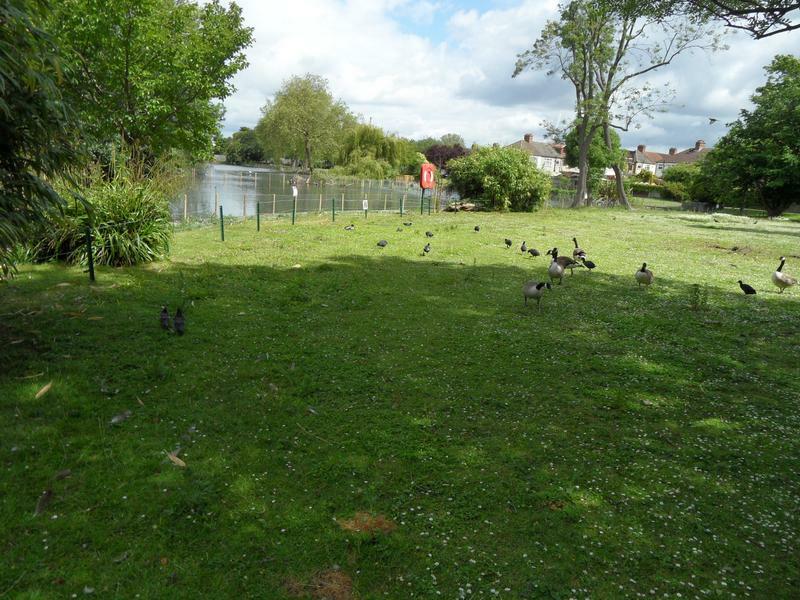 some geese on the grass behind this small pond. 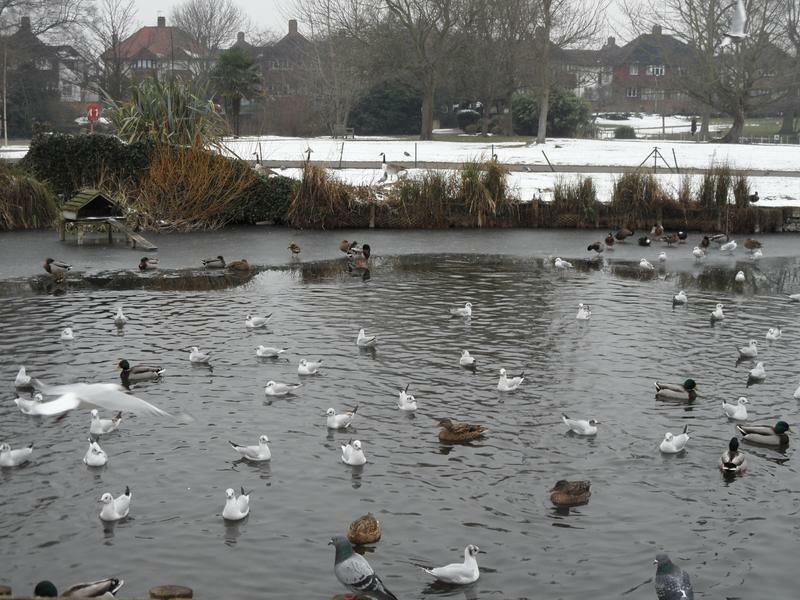 Several Mallards walking on ice at the pond edge, Coots in the water. 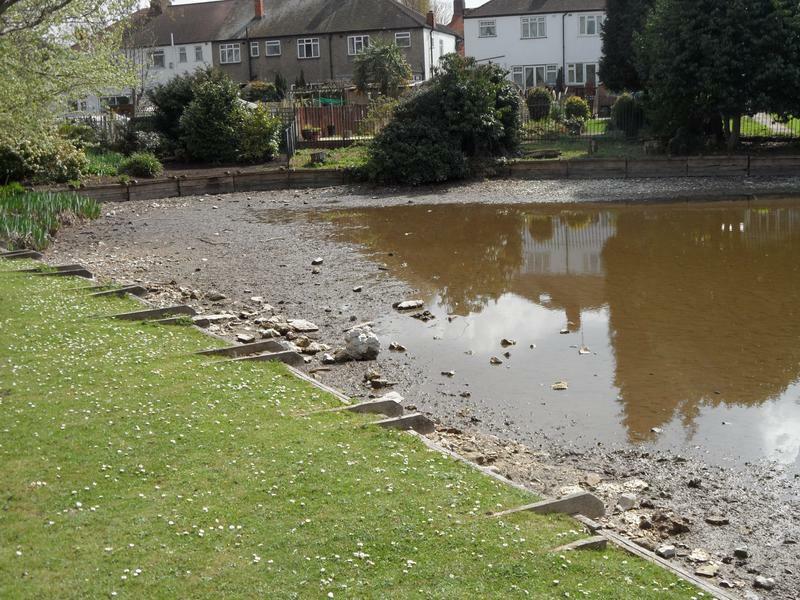 has been dredging mud from the bottom of the pond. 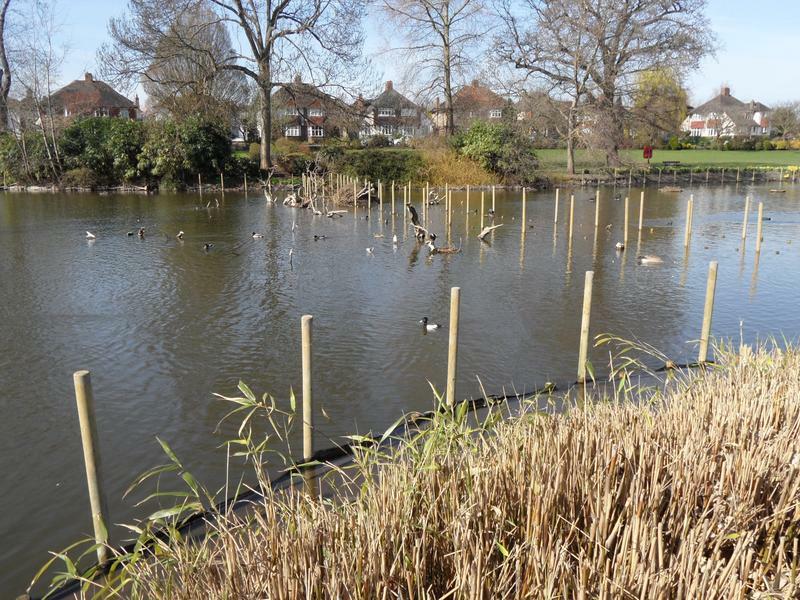 of posts are part of the maintenance, creating a new pond bank. 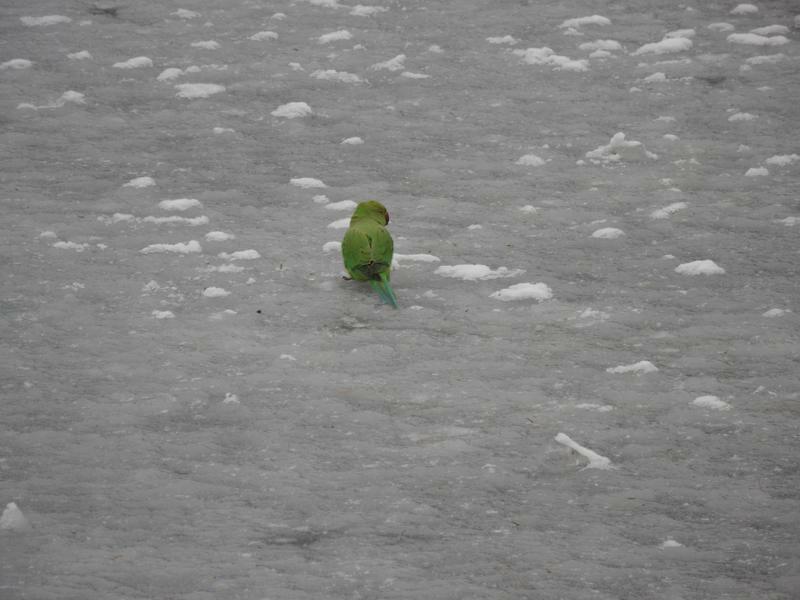 No idea why this Ring-necked Parakeet (or parrot) is sitting in the middle of the ice, but it did fly off so not stuck. 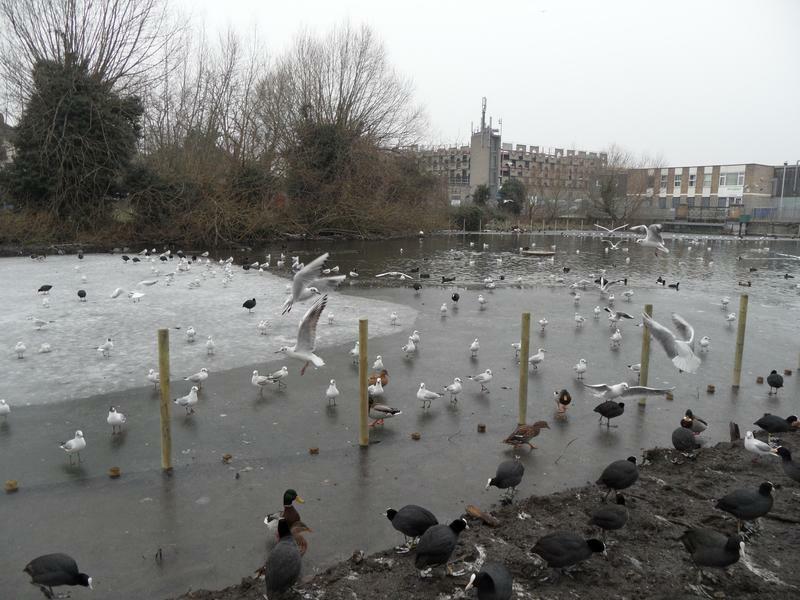 Most of the pond activity is down near the ice free area of the pond, lots of Coots looking for food, and a few Mallards. 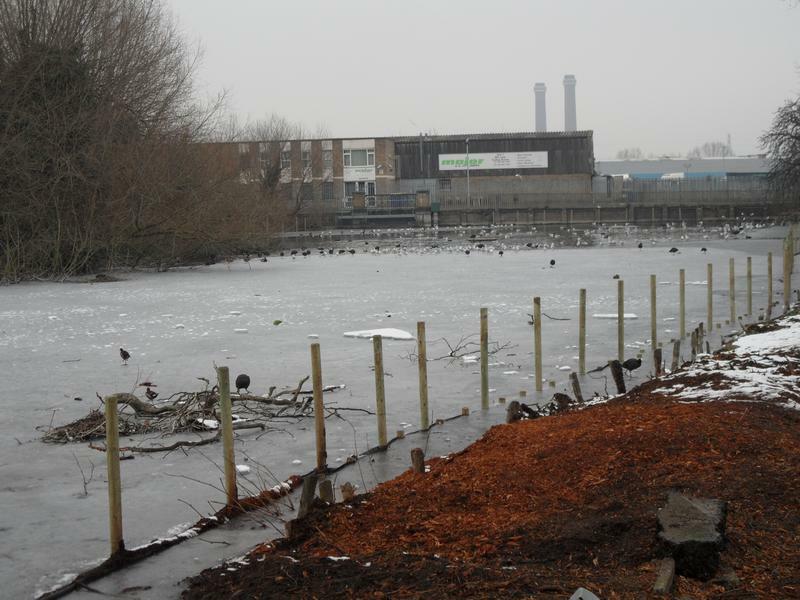 One Mallard, three Tufted Ducks and several Coots, on the ice. 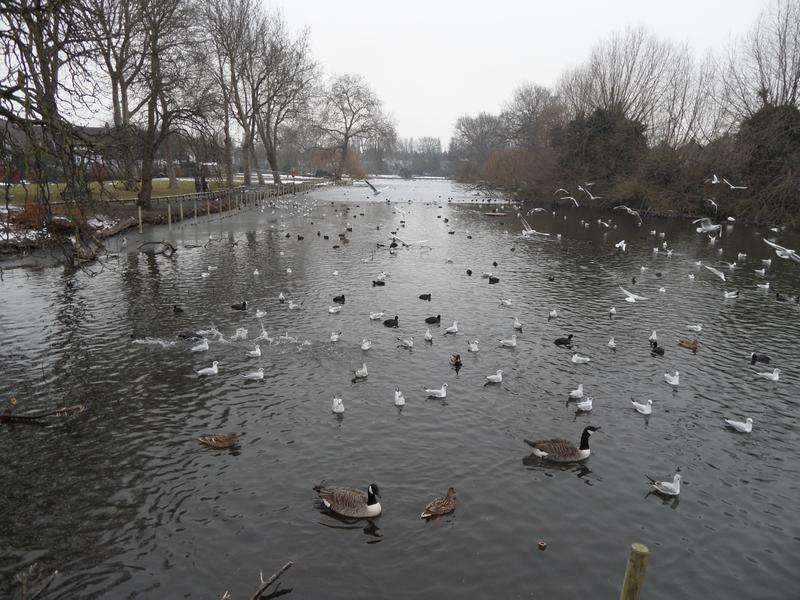 Vast numbers of sea birds, as at all the parks. 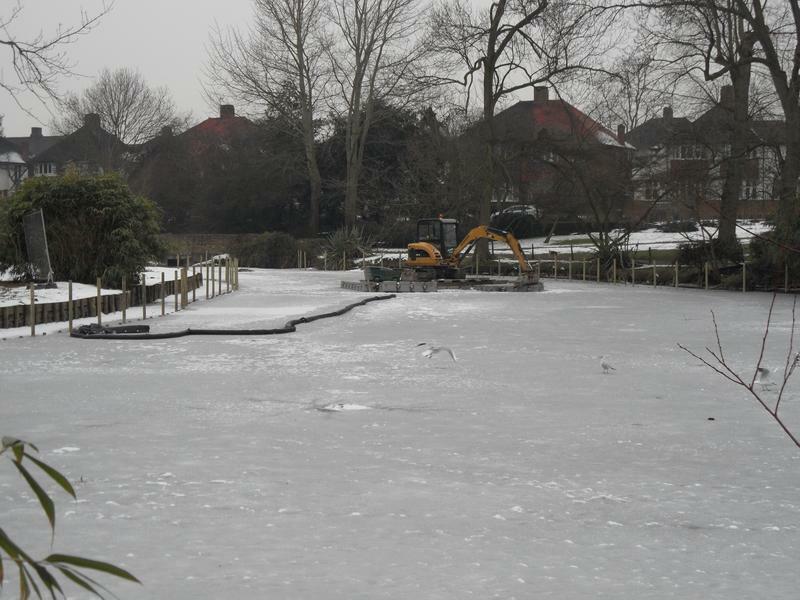 The other end of the main pond with the dredging excavator on it's raft. 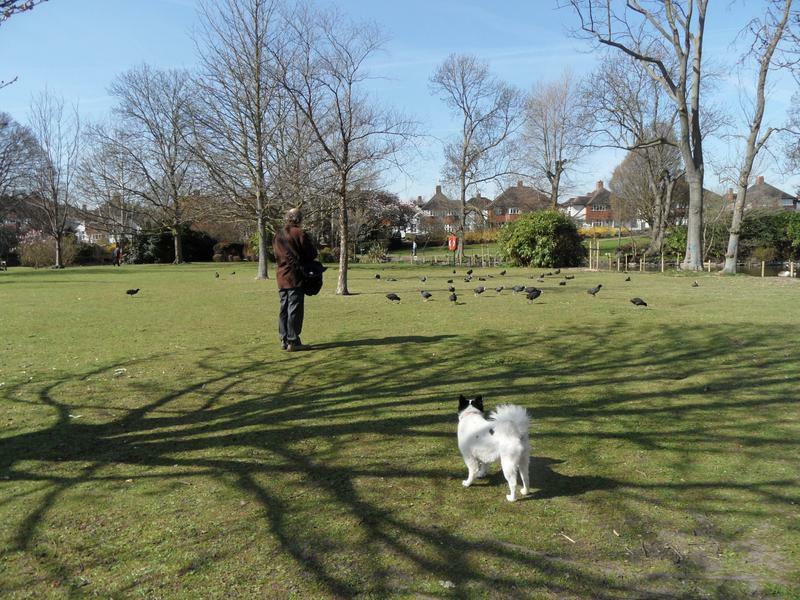 Perhaps the grass is warmer then the snow. 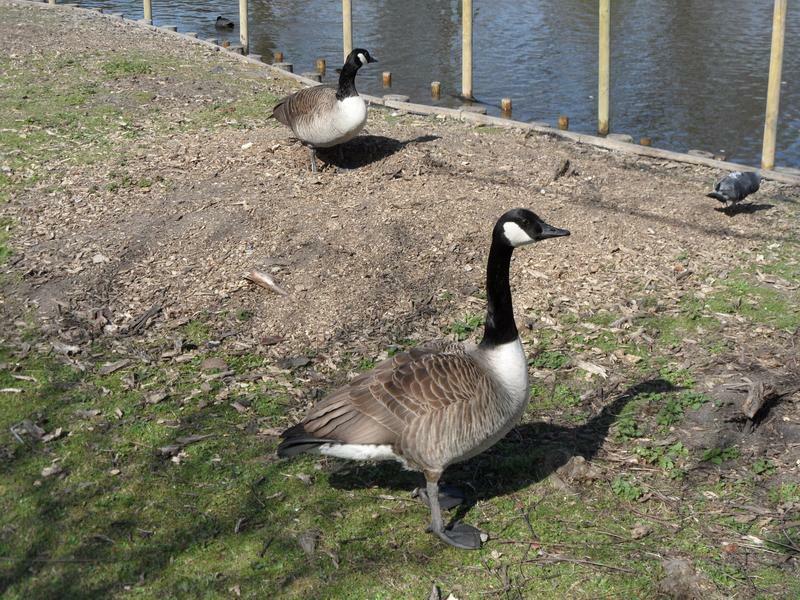 This Canada Goose was hissing as I got closer, protecting it's mate sitting on the raised bank of earth behind, her nest. 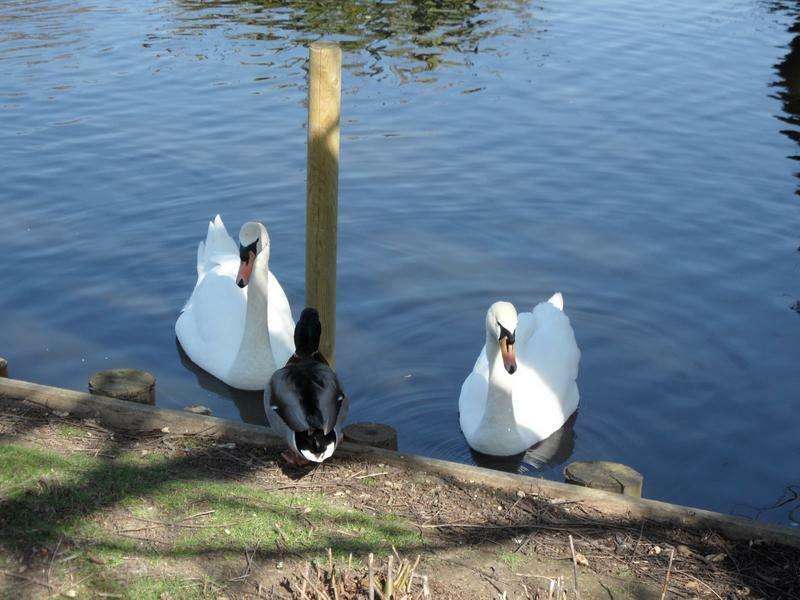 One pair of swans in this park as well. 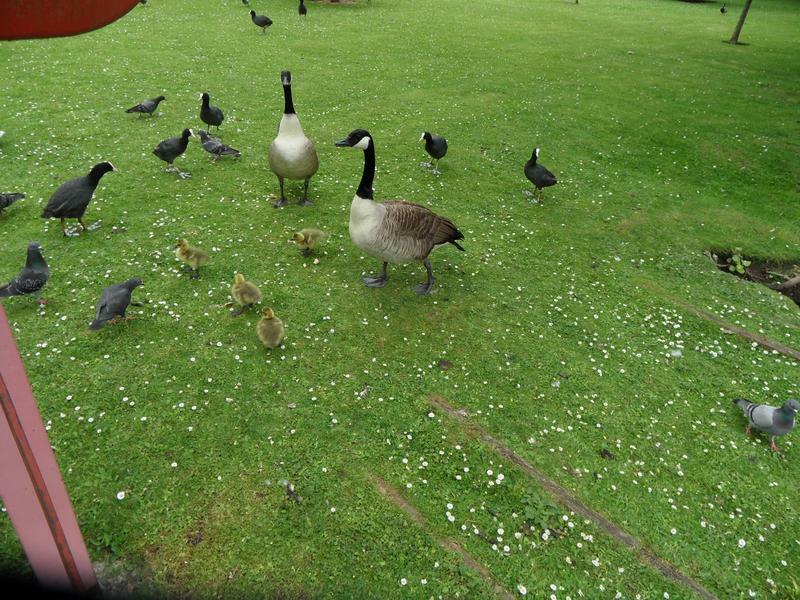 not sure how. 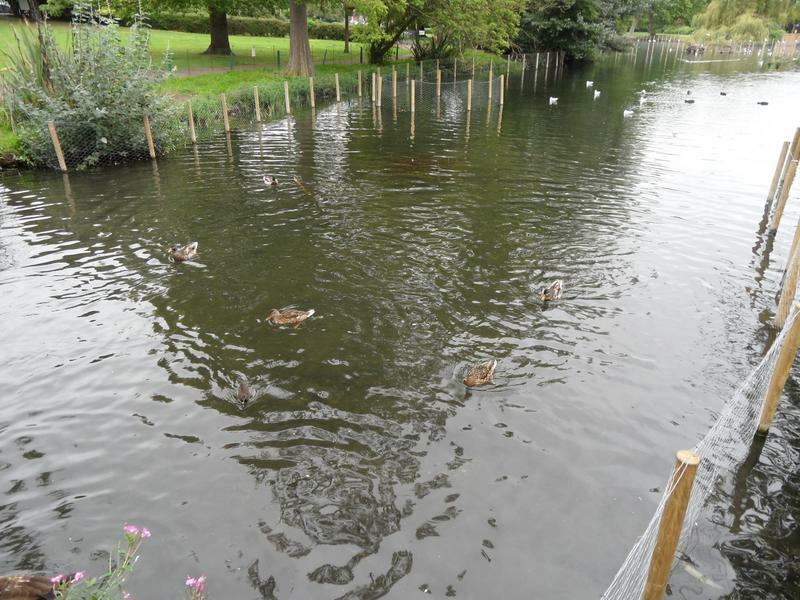 They have also built a Kingfisher nesting bank in the middle of the pond. 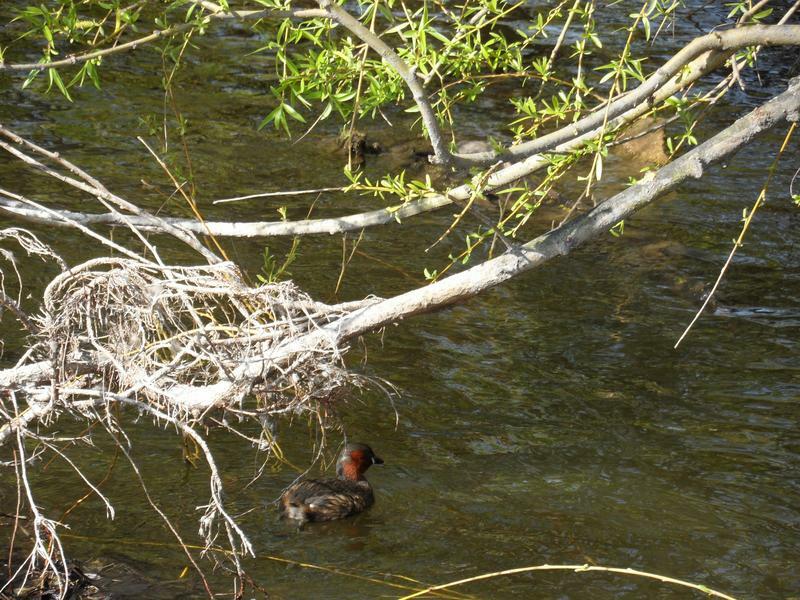 Possibly a Little Grebe, but not a good photo, kept swimming under the branches and away from the camera. 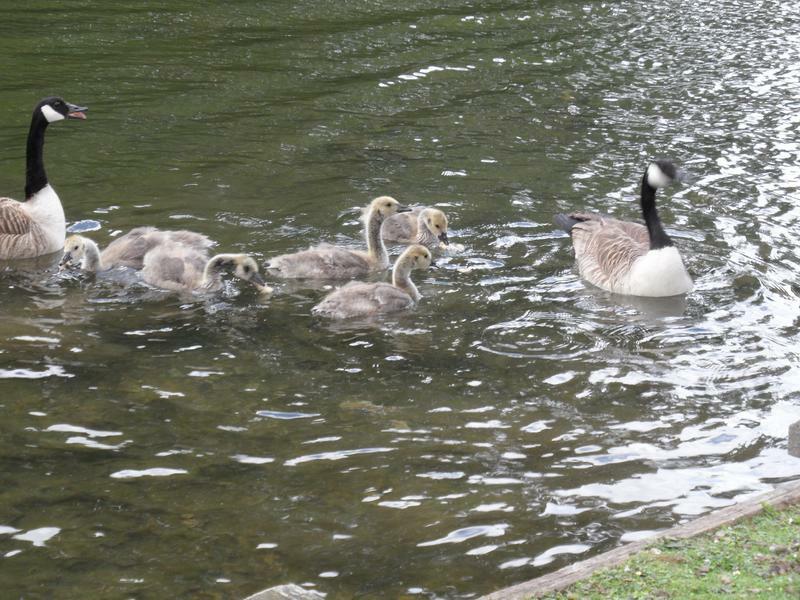 hopefully they will reclaim the pond. 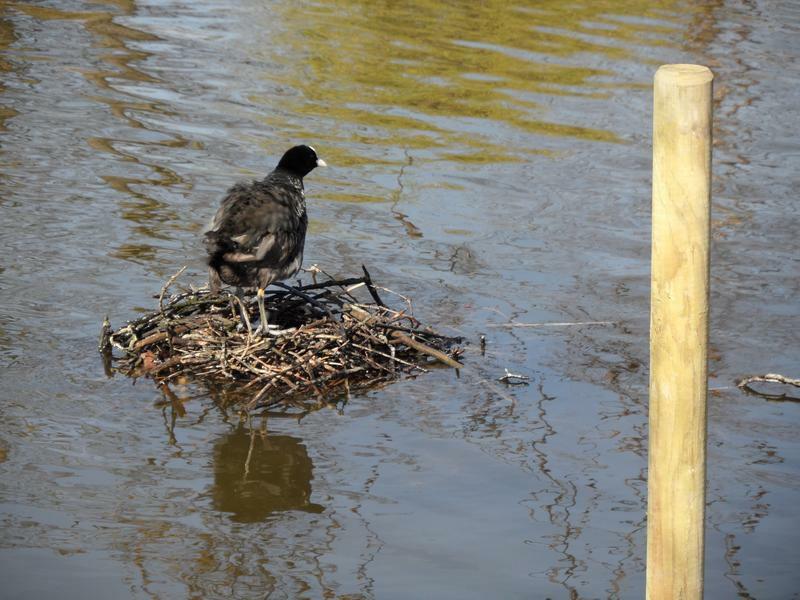 Several nesting platforms have been added, one of which these Coots have taken over. 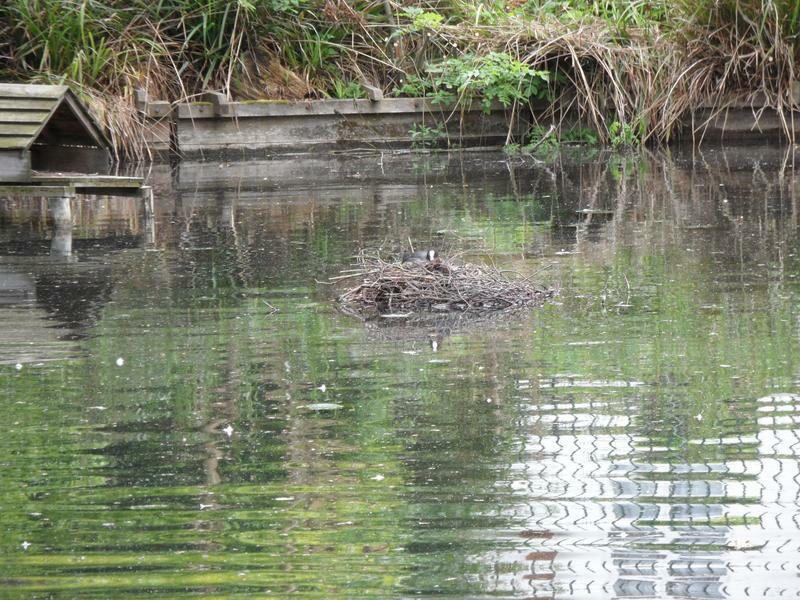 The new Kingfisher nesting bank in the centre of the pond. 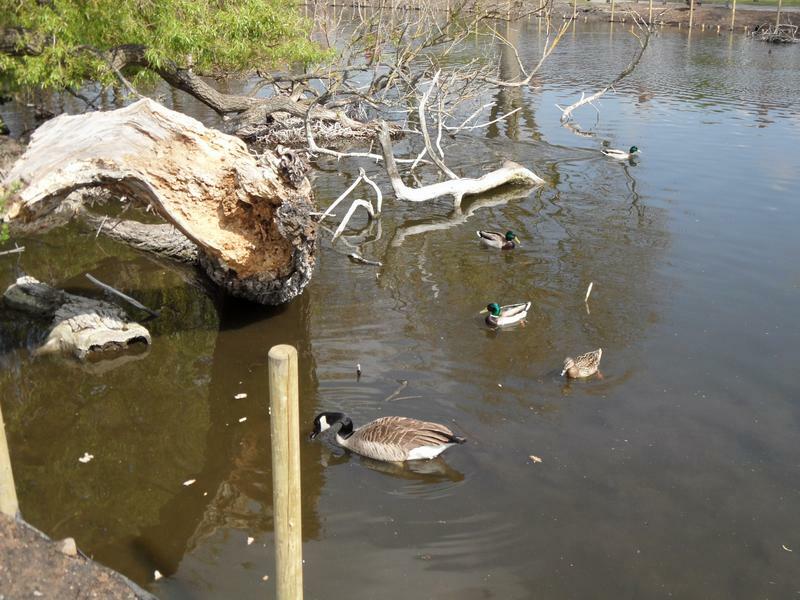 Close up of the new Kingfisher nesting bank, built from dredged materials, currently occupied by geese. 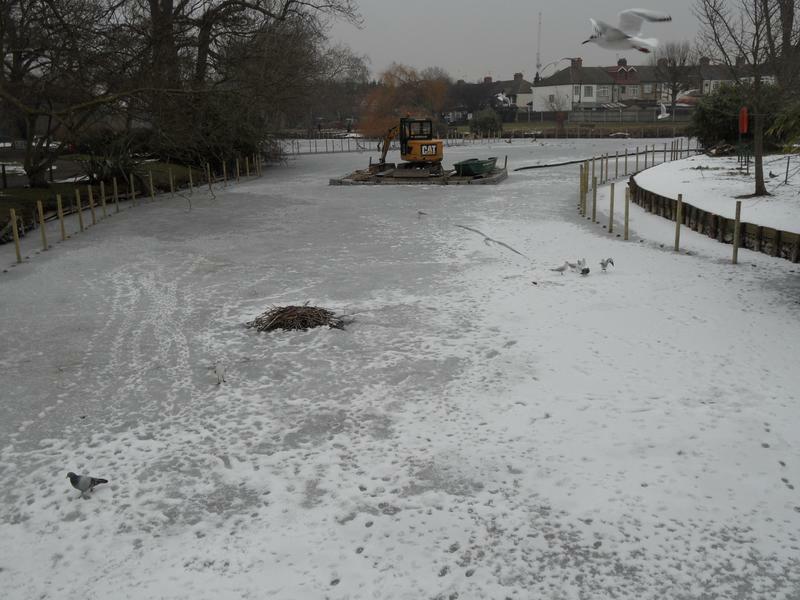 The smaller pond at top of the park, seems to have been partially drained for maintenance, normally a lot of birds here. 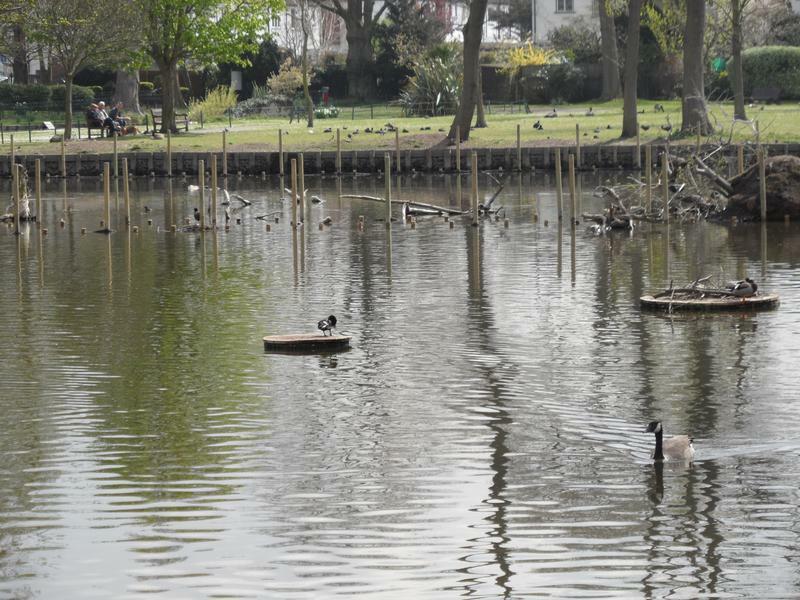 13th April 2012, construction work still going on, a line of stakes for the goose barrier across the pond. 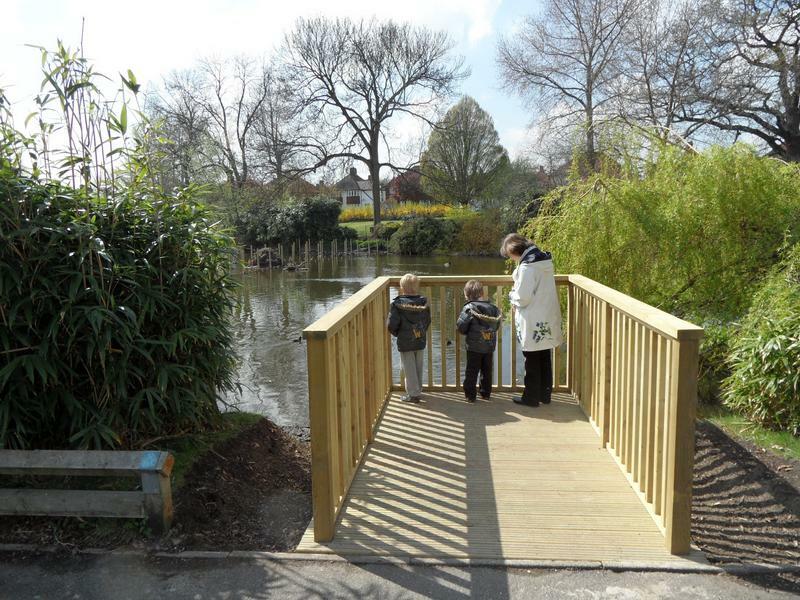 A second smaller viewing platform has been installed. 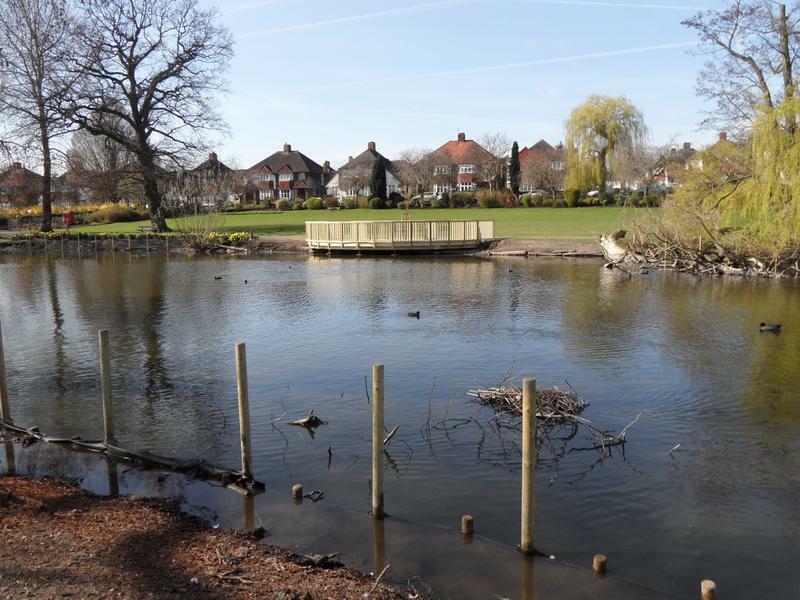 The new much large viewing platform, the pond is relatively quiet with all the winter sea birds having left and not many geese. 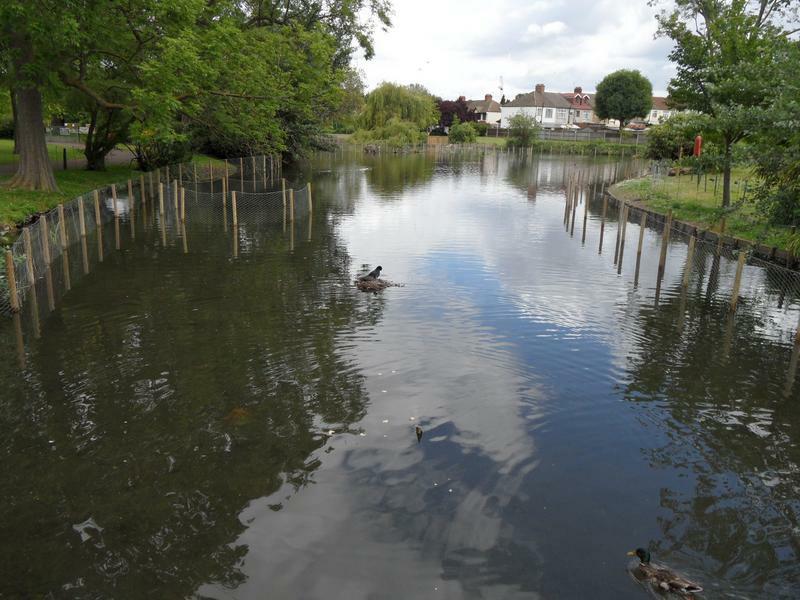 Long view of the quiet pond, with two new islands. 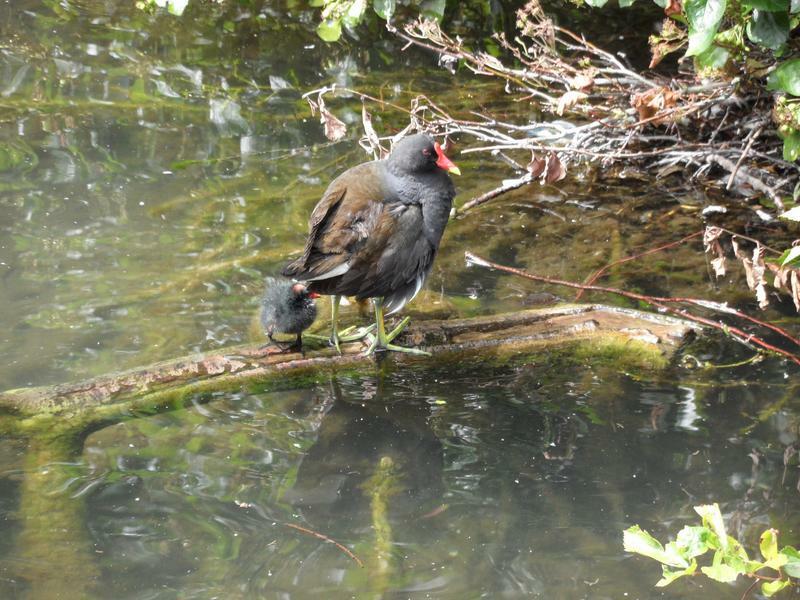 One of the islands has a successful nest. 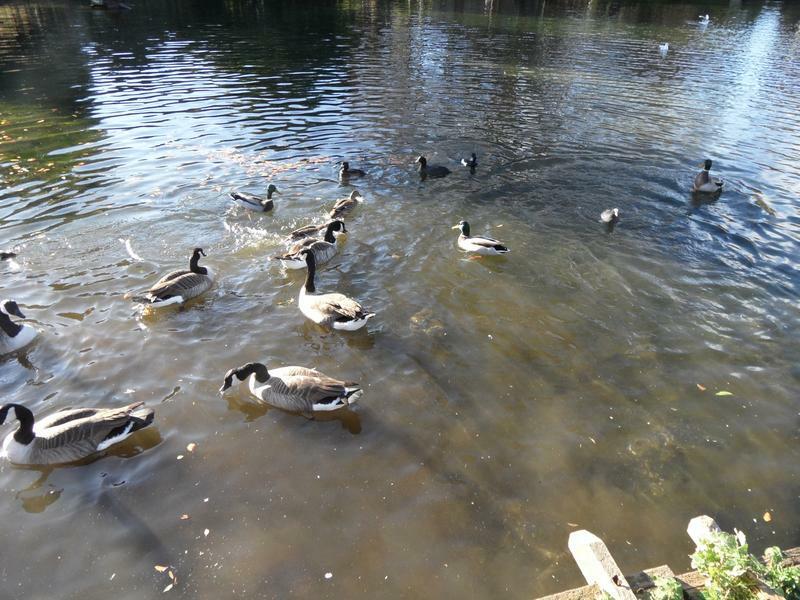 Mallards and one goose looking for food. 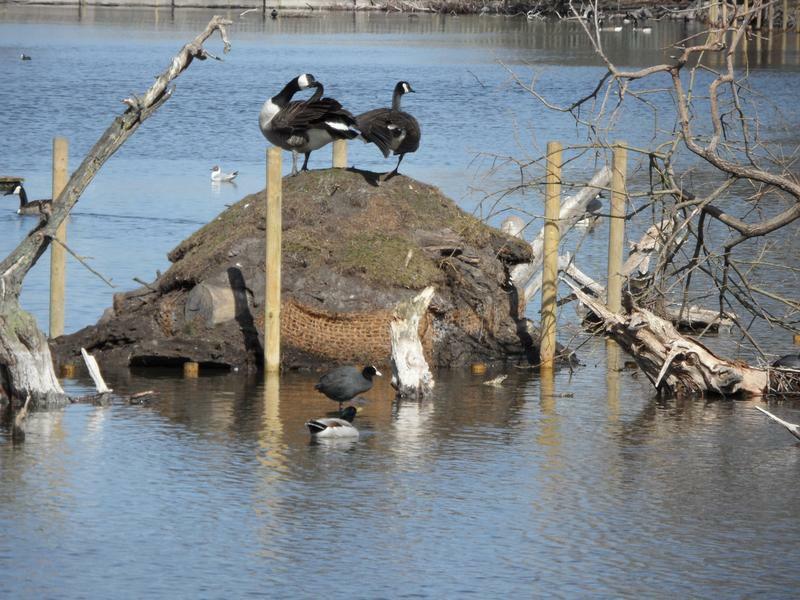 Two more of the new islands with the new Kingfisher nesting bank in the background. 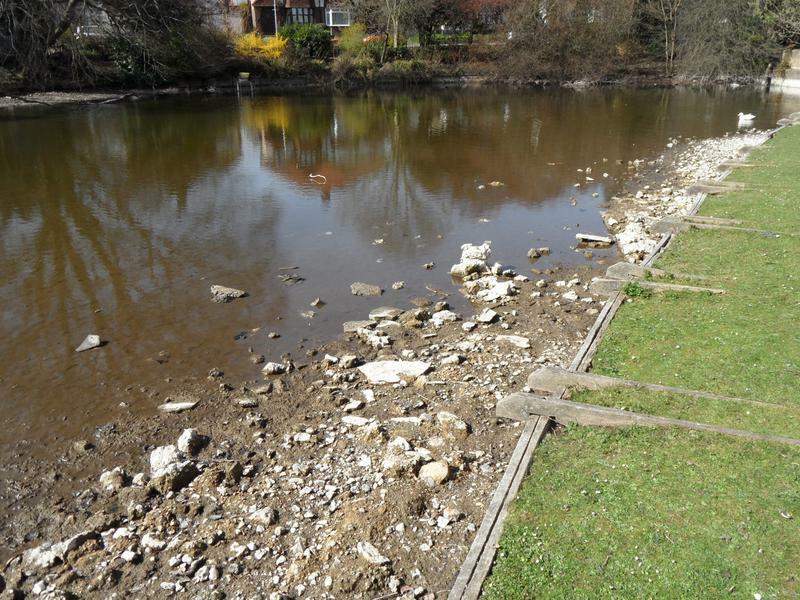 work is currently going on to create an open stream and pond. 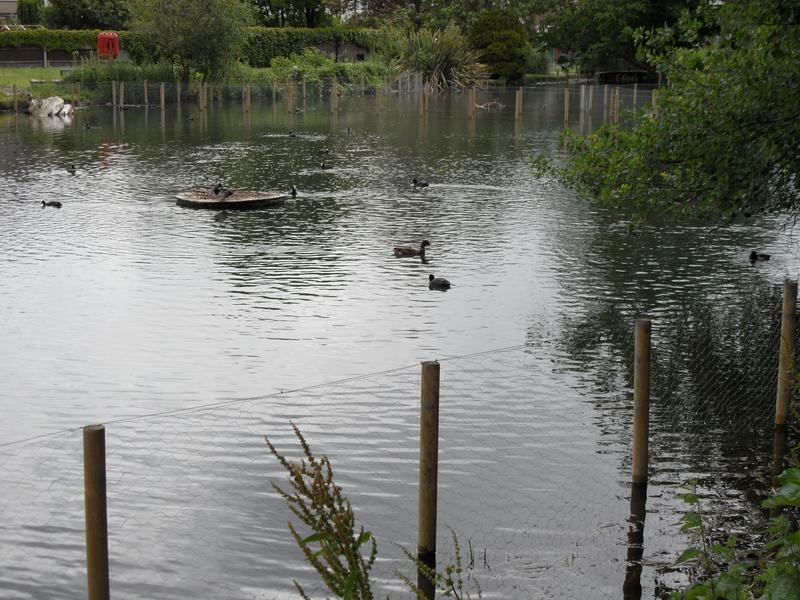 Large numbers of Coots are still living on the grass (in the distance) while work is undertaken in the pond. 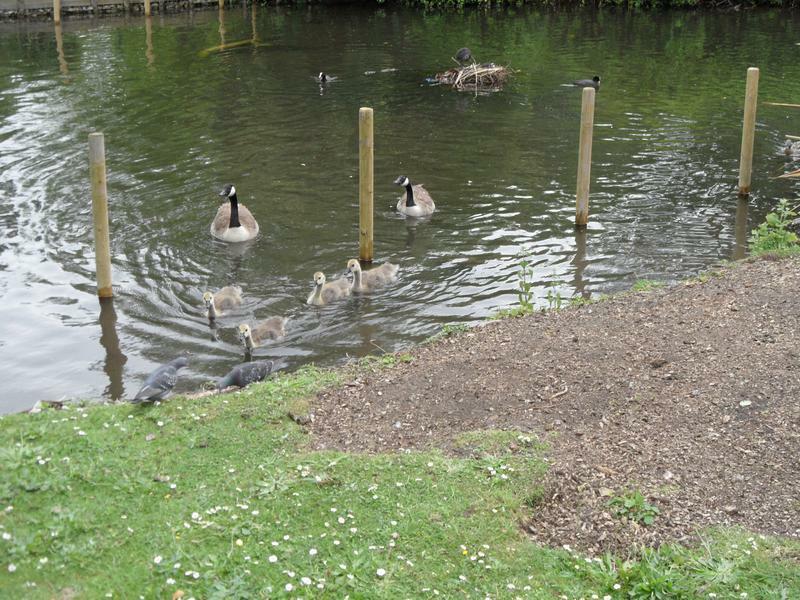 1st June 2012, the first Canada Goose family with five goslings, waiting for passers by on the main path. 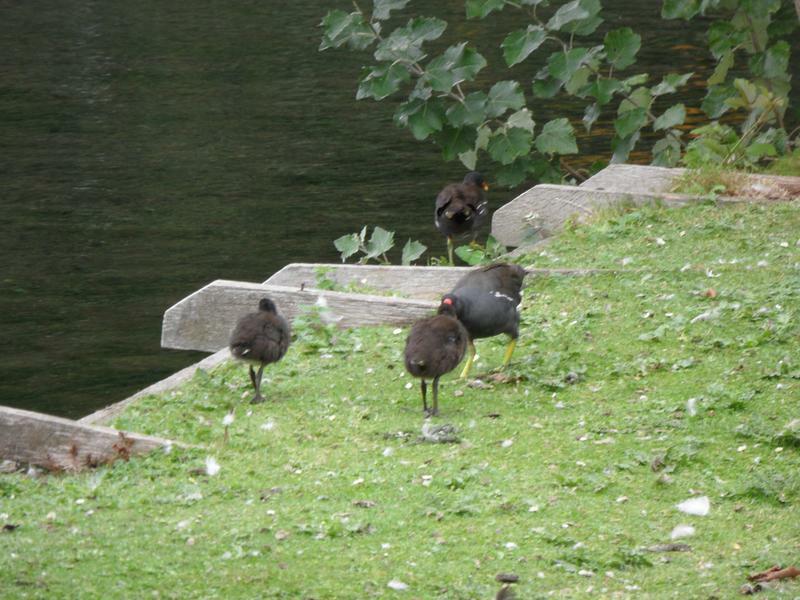 But they follow us over to the pond looking for more food, with several Coots. 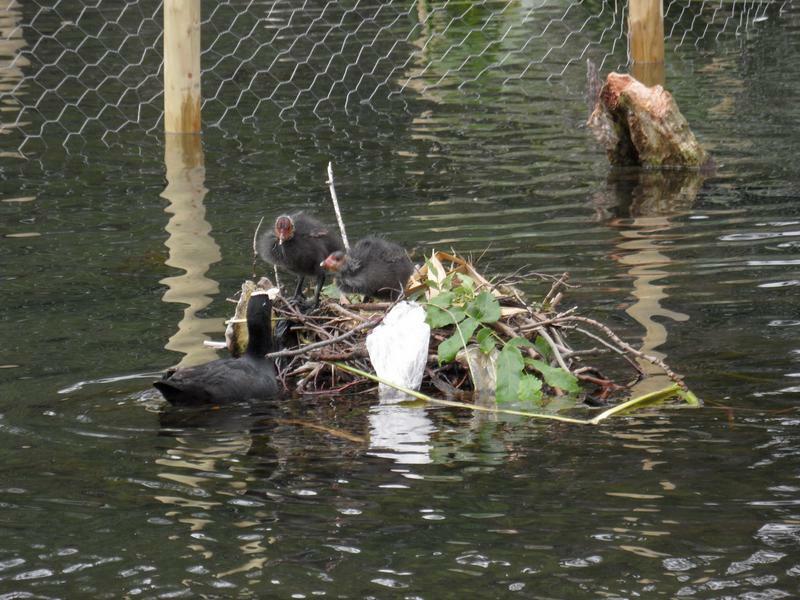 One Coot on her nest in the small pond. 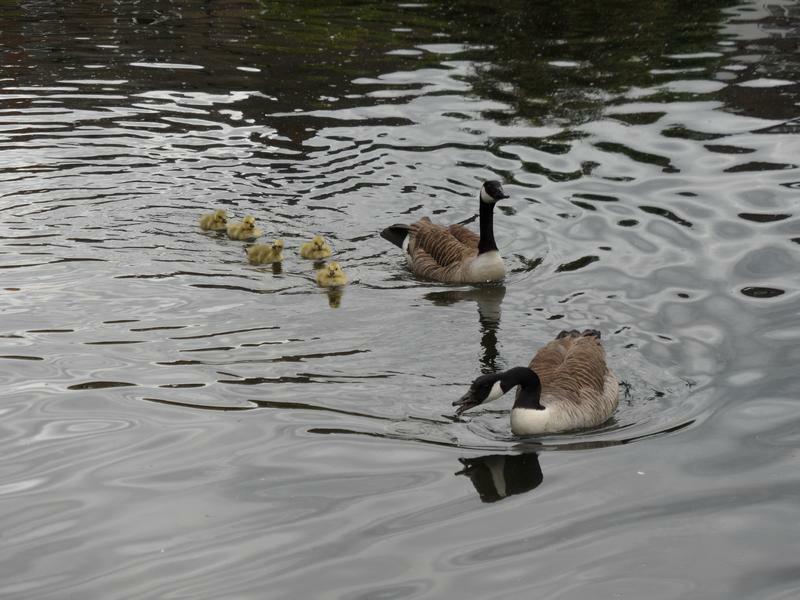 The goslings are now on the water. 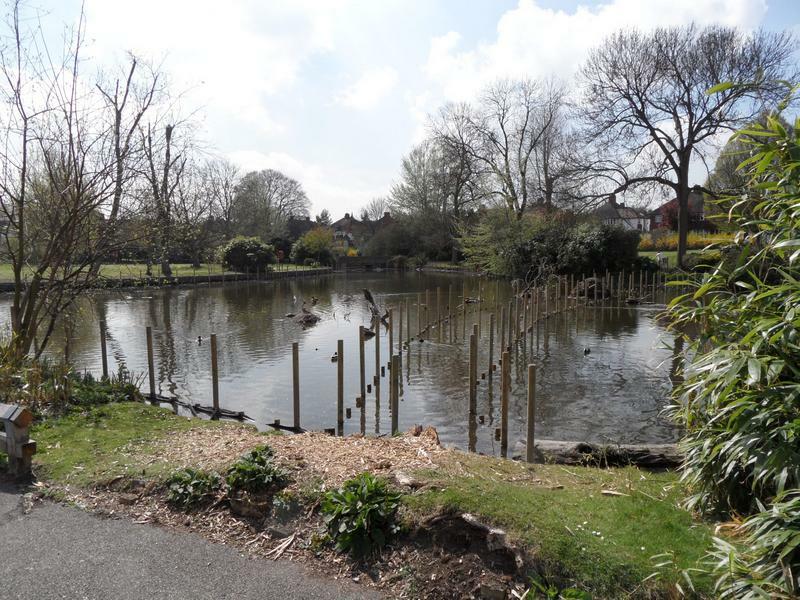 Vew looking north up the main pond, no new building work since our last visit, just a row of posts across the pond. 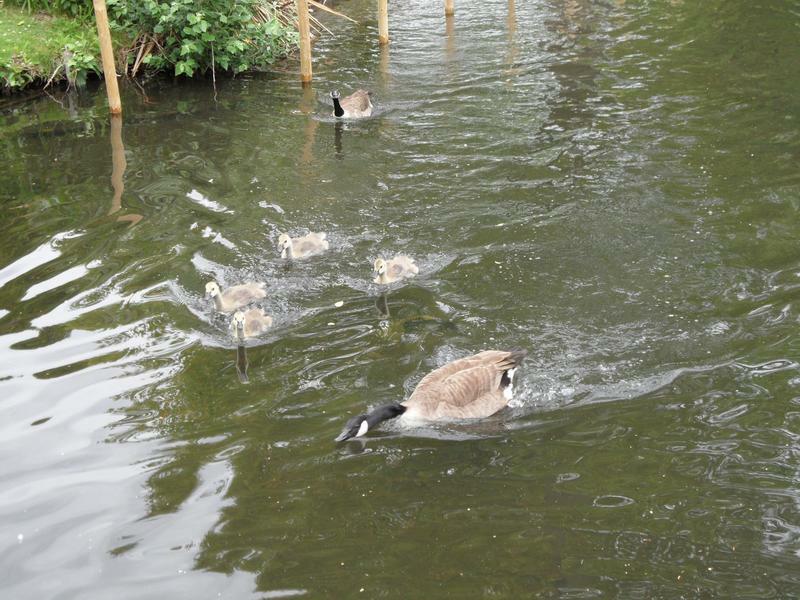 The second goose family, four much large goslings heading our way for food. 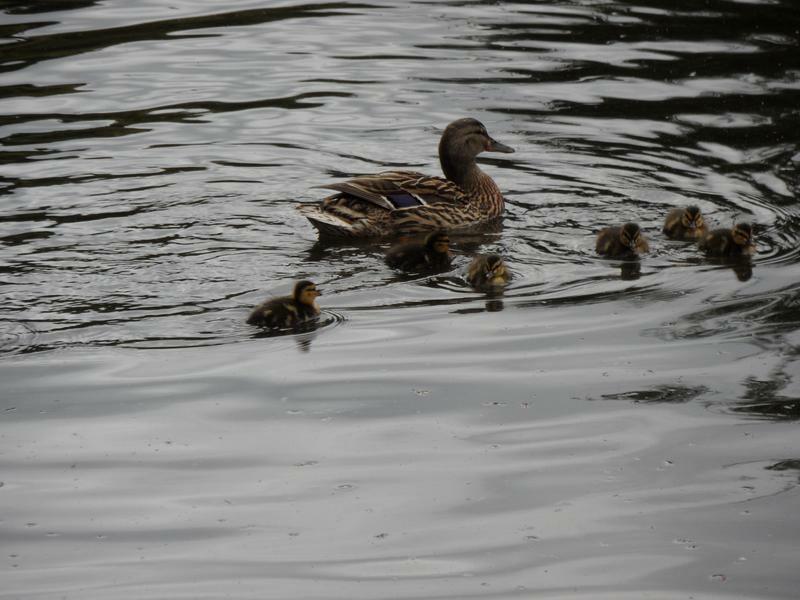 And one Mallard family with six ducklings, about a week old. 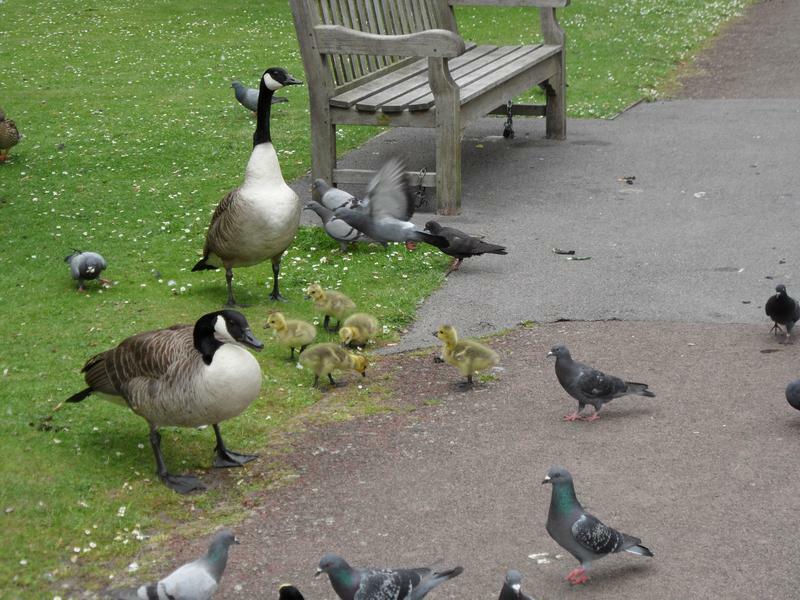 The second goose family again. 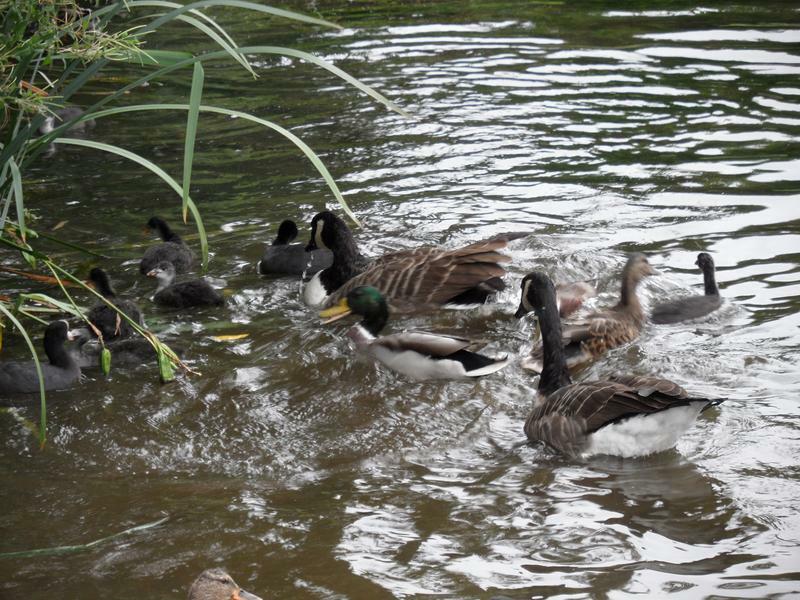 And now about to leave the pond. 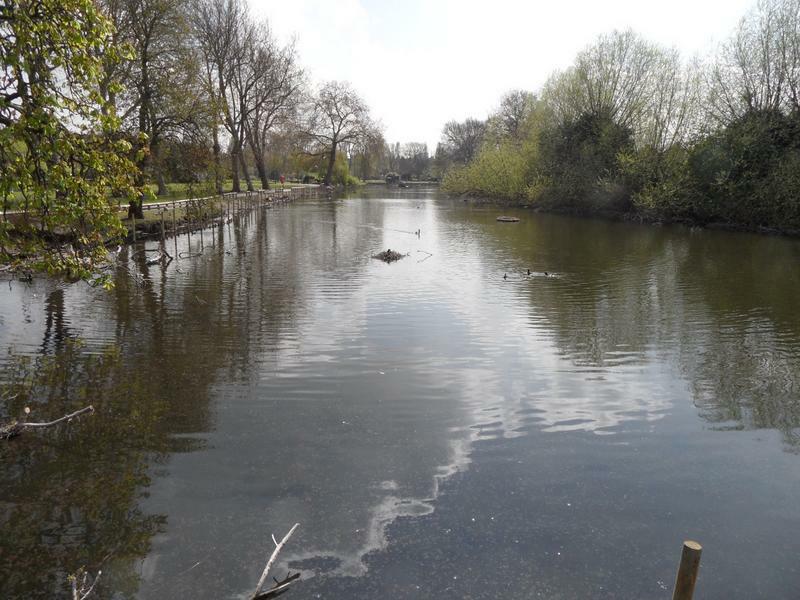 Looking south down the main pond, not much action here today. 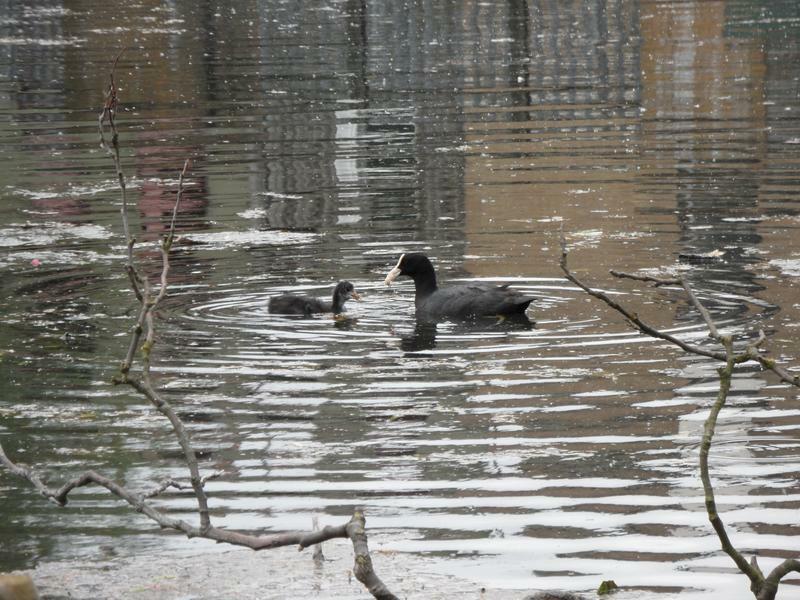 A Coot feeding her chick. 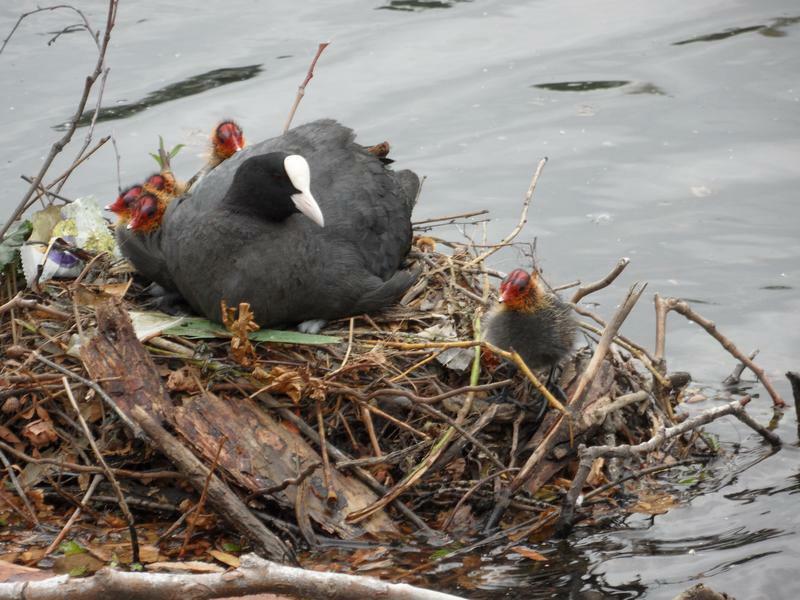 Another Coot with four chicks still in the nest. 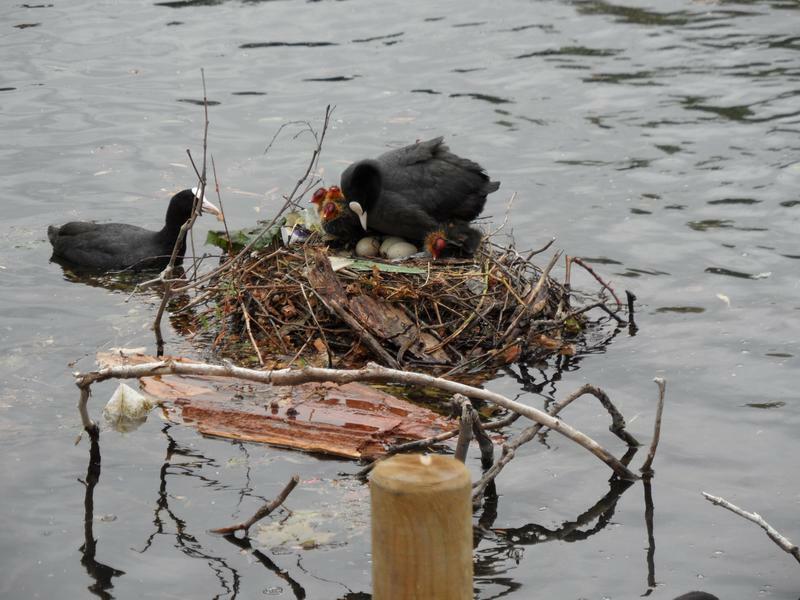 The Coot mother seems to have more eggs in the nest, despite the four chicks she is already looking after. 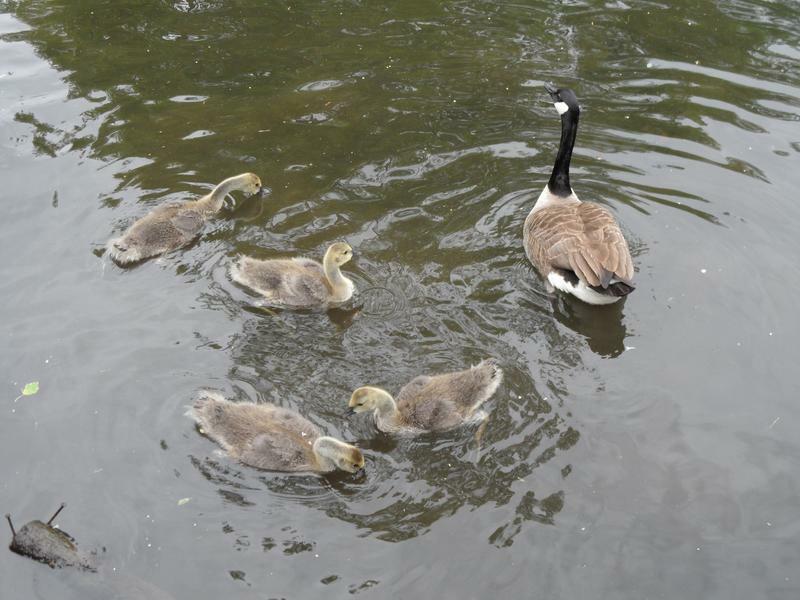 1st July 2012, the goslings are now about five weeks old. 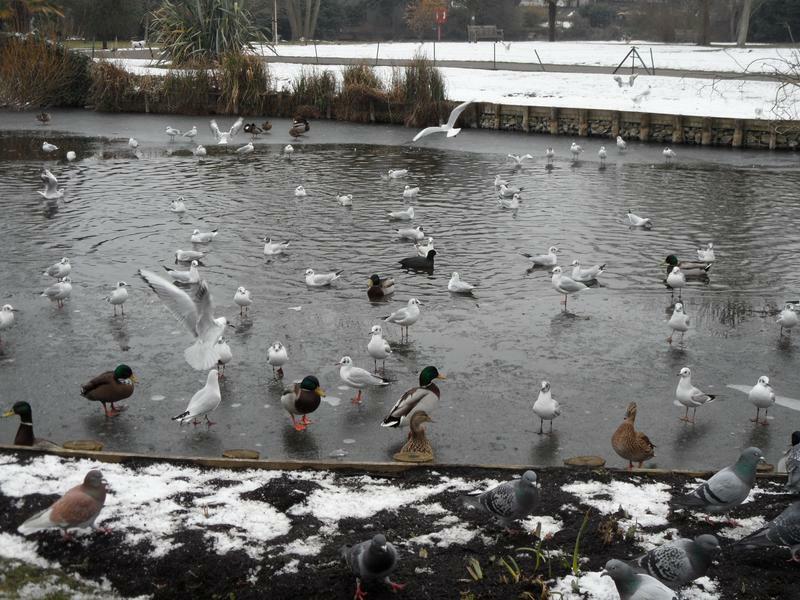 done in the main ponds. 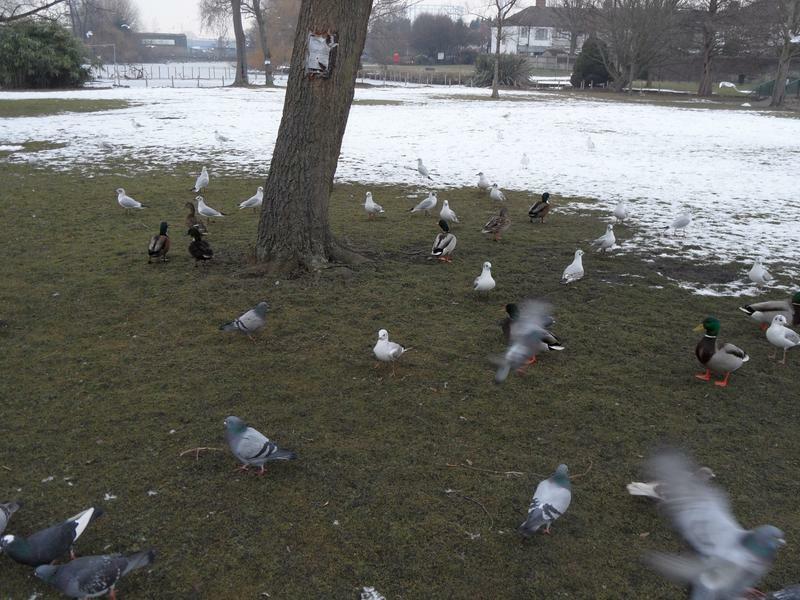 them. 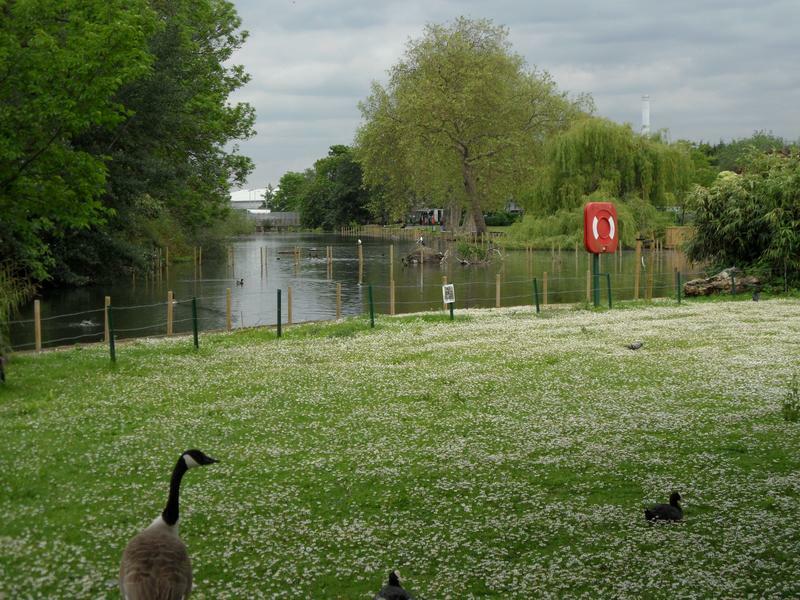 Without the fences, the plants would simply become duck food very quickly. 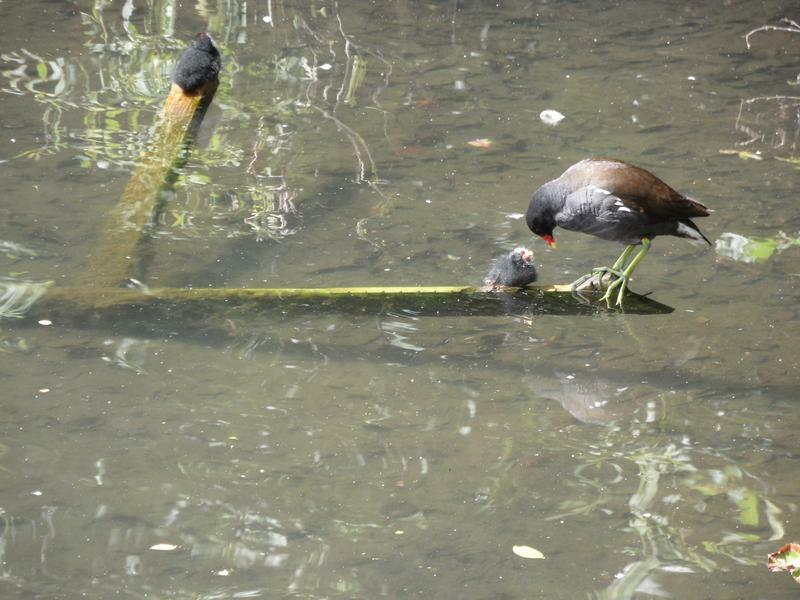 A Moorhen looking after her two chicks, balanced on an old fence in the water. 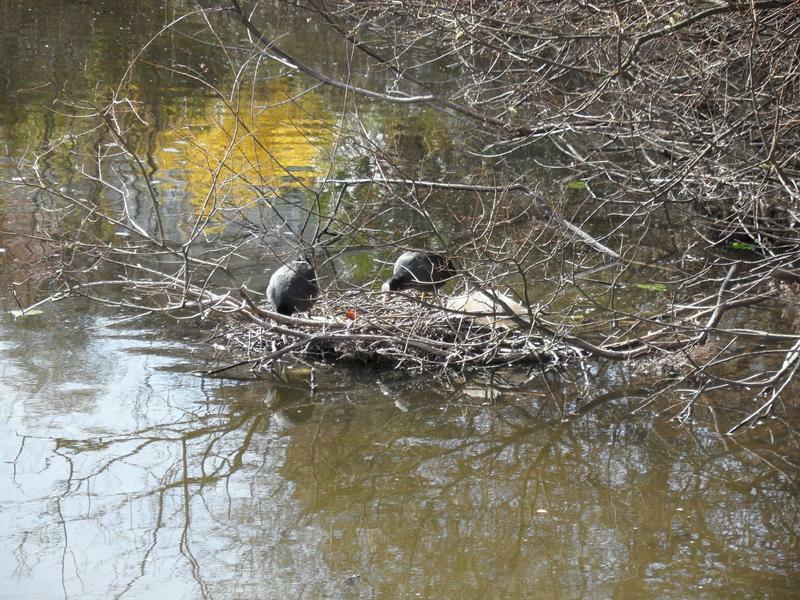 Now two of them have moved to an old branch. 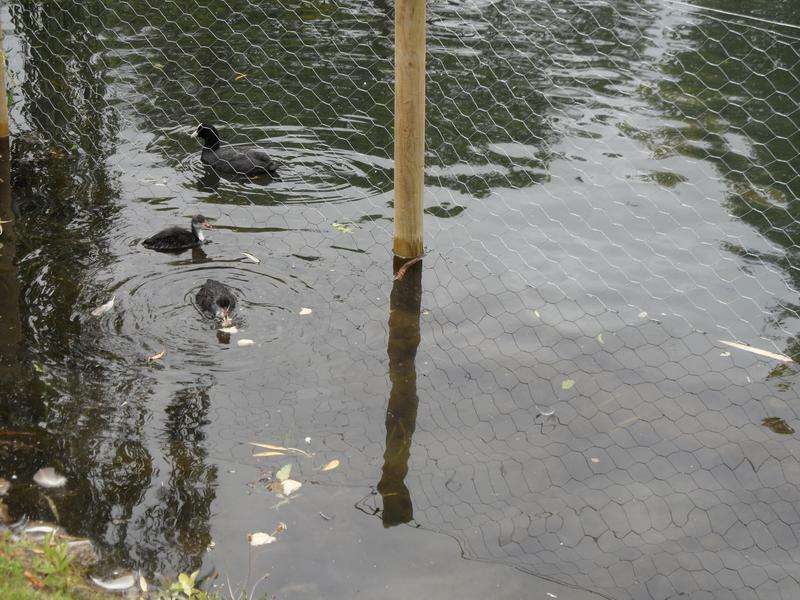 must have used a mile of chicken wire. 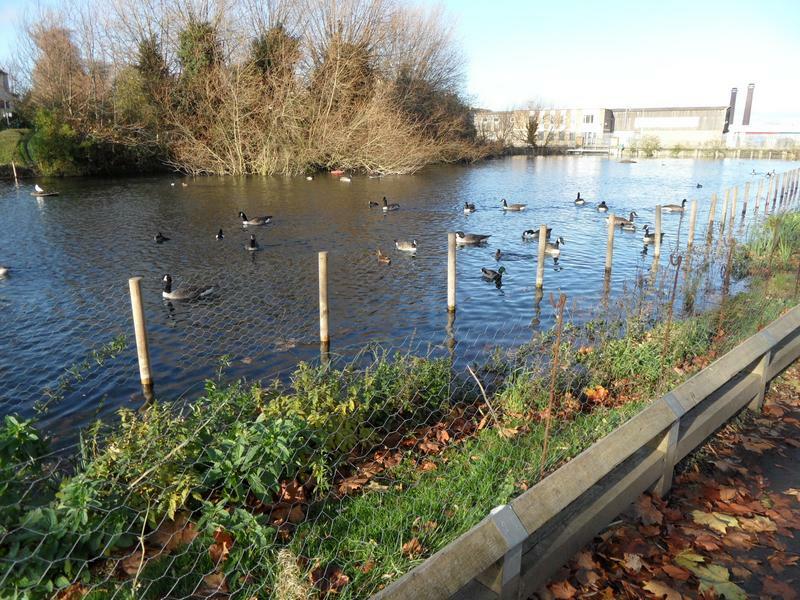 There are very few birds on the main ponds, still getting used to the new fences. 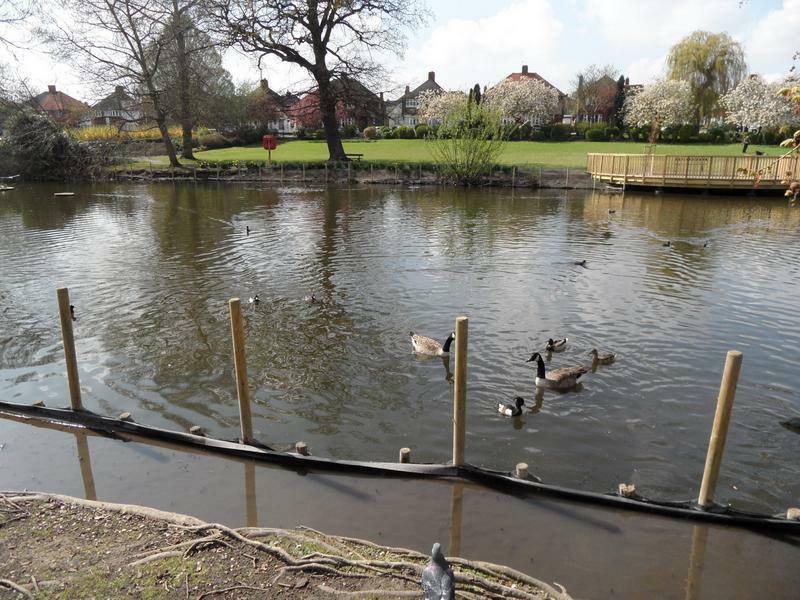 Some Mallards near the new viewing platform. 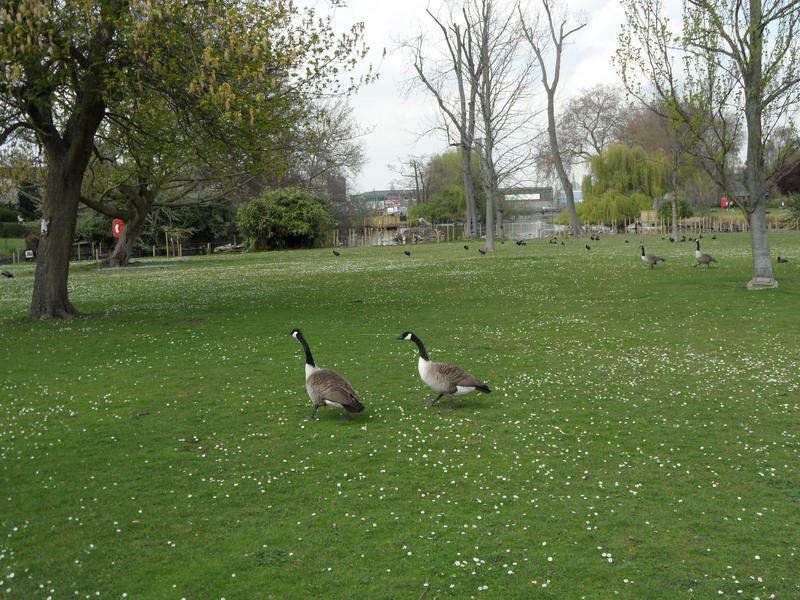 here there is a passage from the water to the grass for geese and ducks to exit the water. 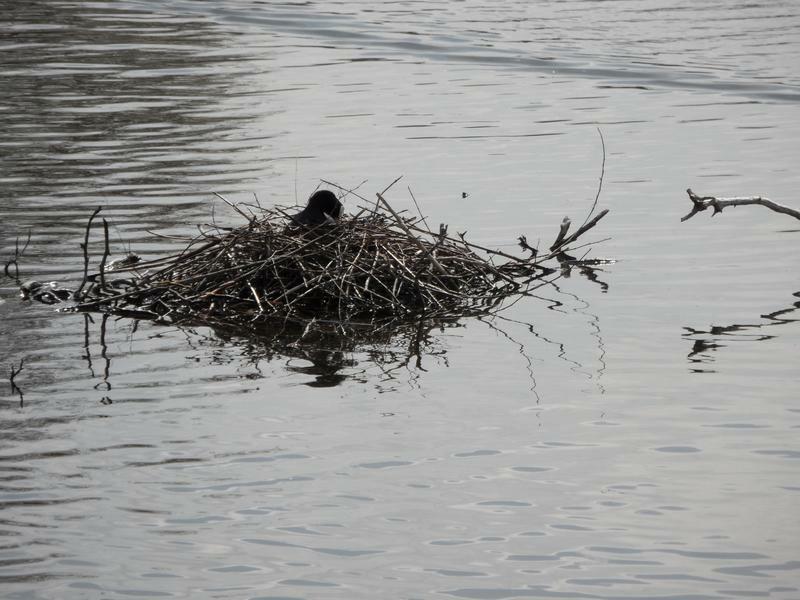 Another Coot nest with two chicks. 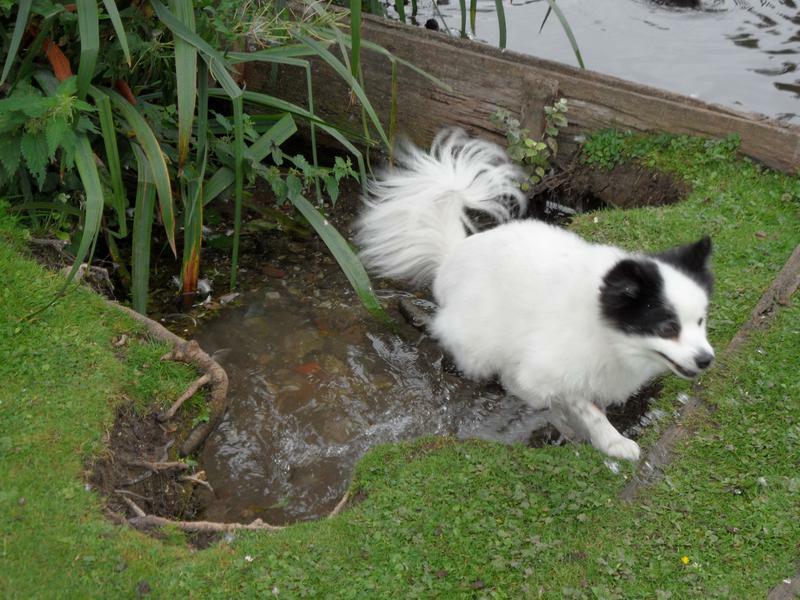 September 2012, Lucy having a quick paddle. 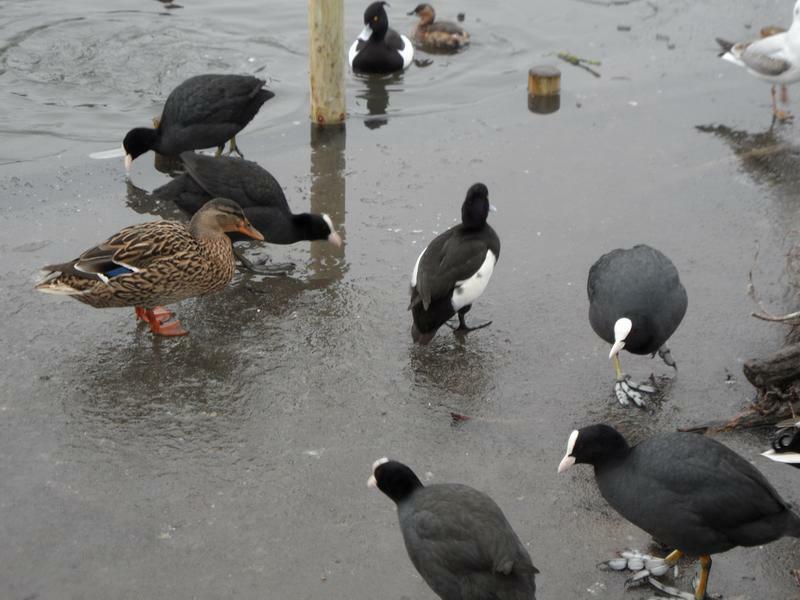 A Coot family, with Mallards and geese trying to get their food. 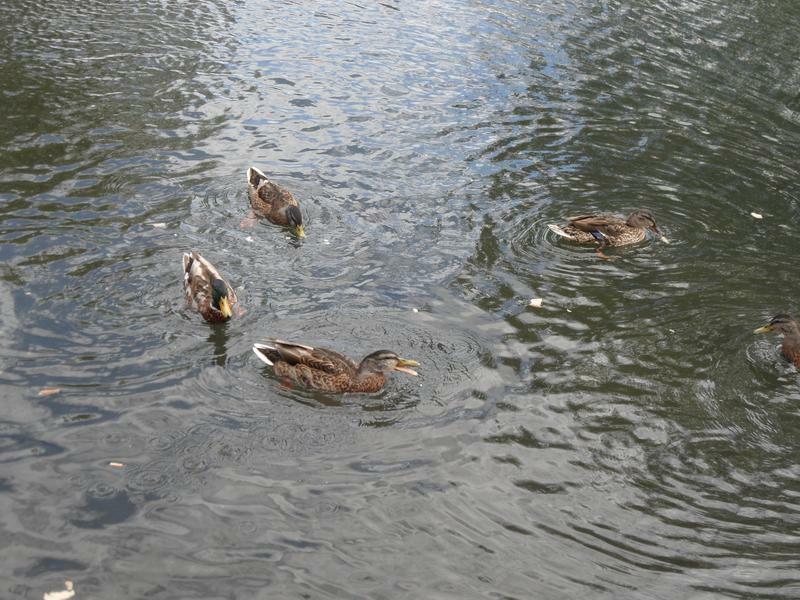 The end of the main lake, a few Mallards down here. 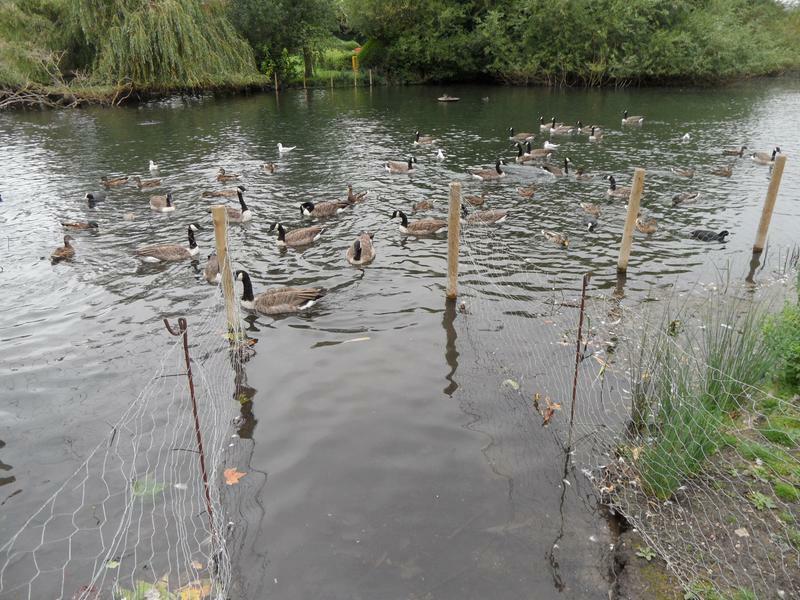 The new plants are growing protected by the netting, plenty of Canada Geese here today. 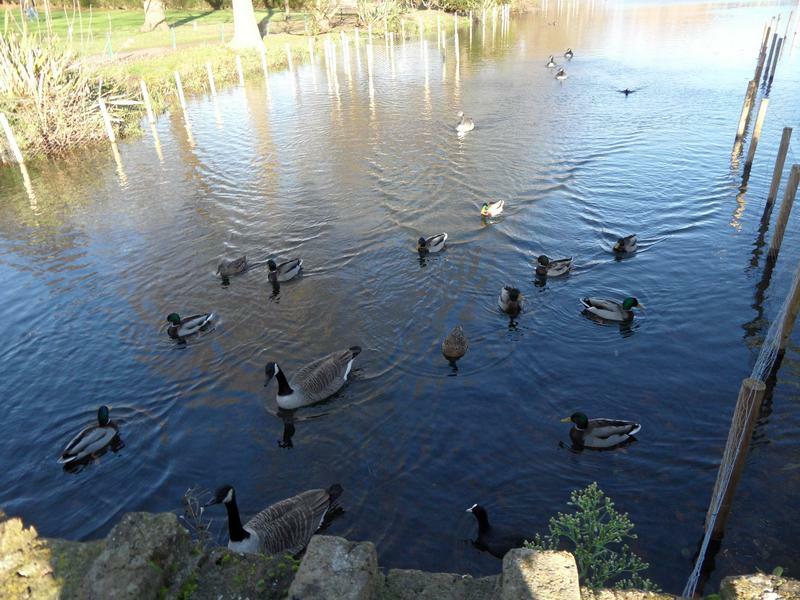 November 2012, the lower pond, mix of Canada Geese, Mallards, Coots and Moorhens. 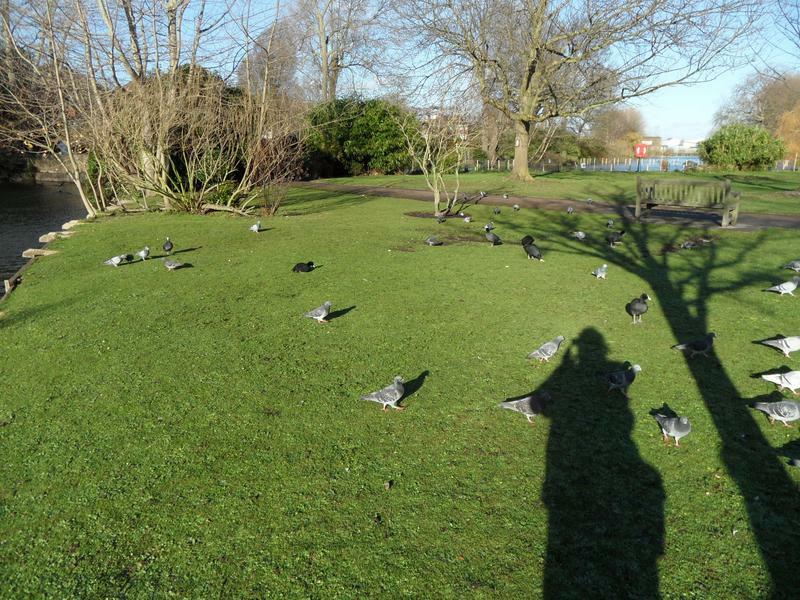 Lots of Coots on the grass (and my shadown) but the pigeons get to any food too quickly. 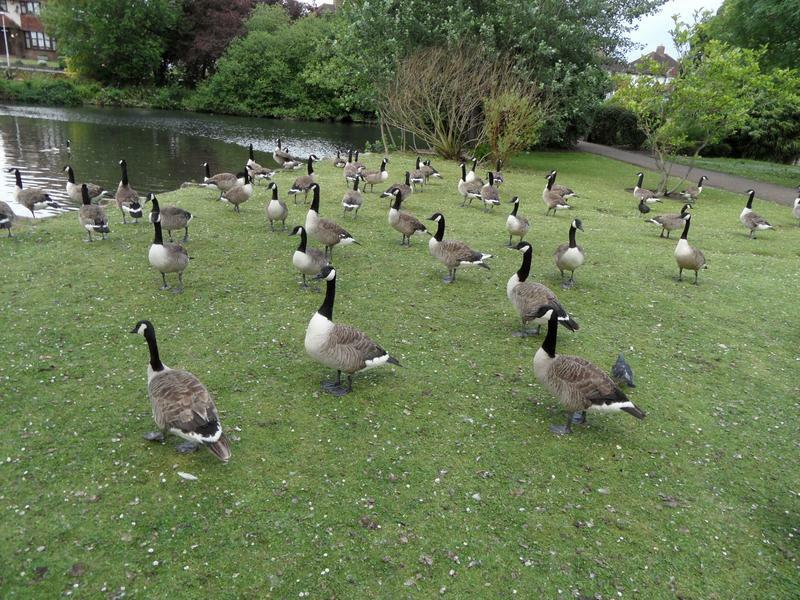 Quiet of lot of fighting between the geese. Sun is low in the sky so washed out photos. 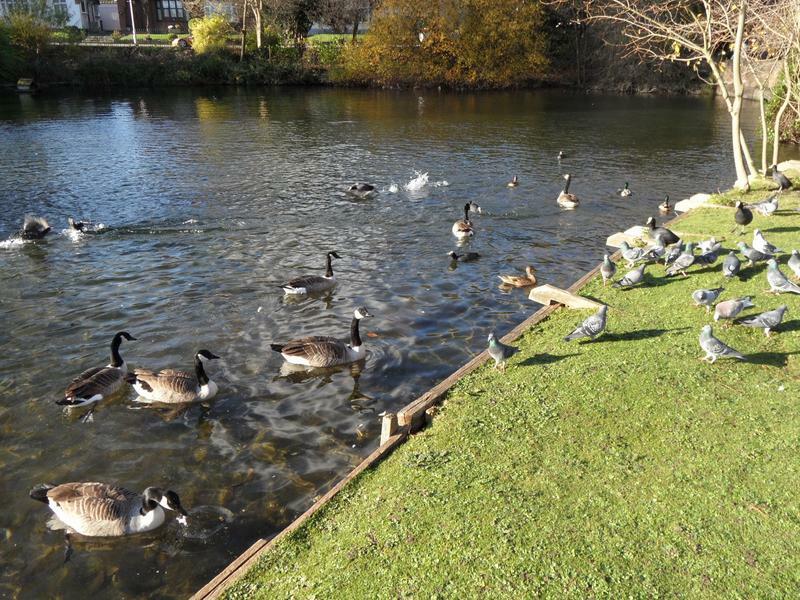 Plenty of ducks waiting for food by the bridge. 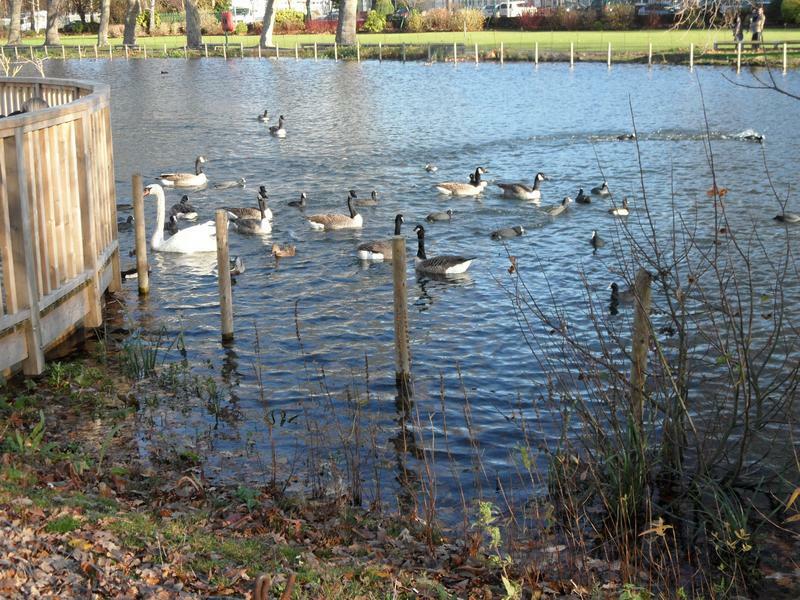 The Mute Swans are still here, and hungry. 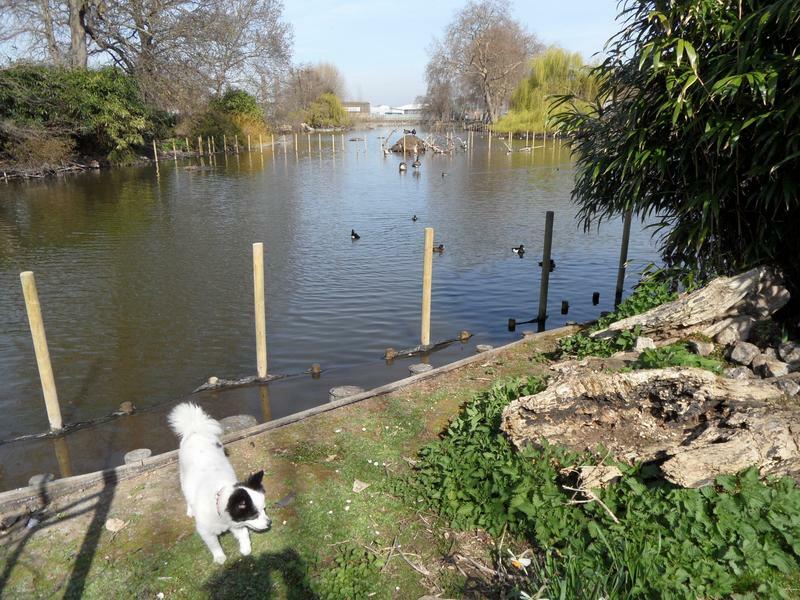 The new planting is growing slowly, but it was a cool spring and summer so nothing spectacular. 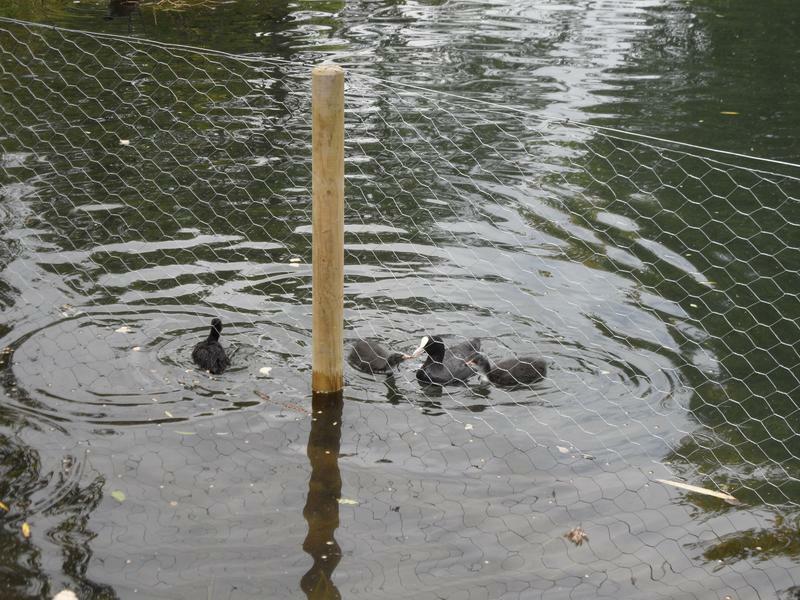 The Coots used to live around this part of the long pond, but don't seem to like all the new fences. 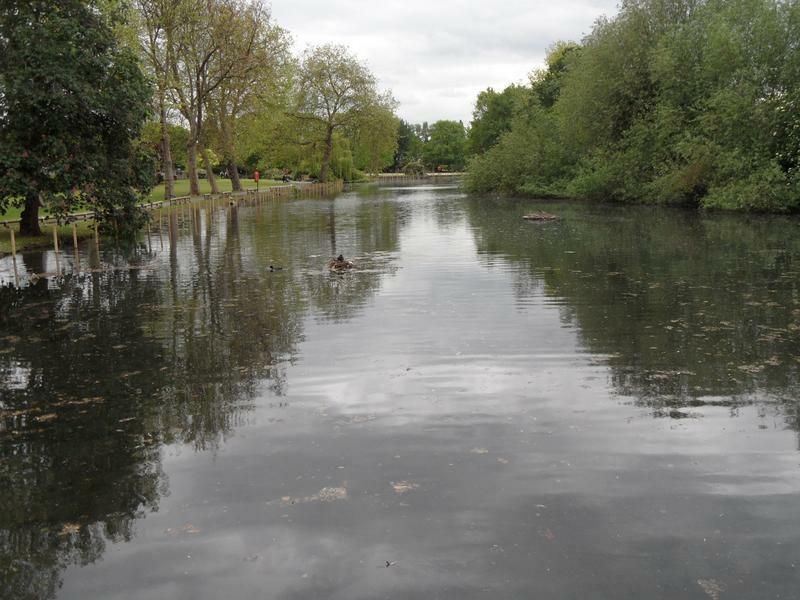 Very quiet in the centre of the pond and the new Kingfisher nesting bank looks very lonely.